You can zap your muscles—literally send an electric current down to nerve fibers, fire your motor neurons, and stimulate a strong muscle contraction. 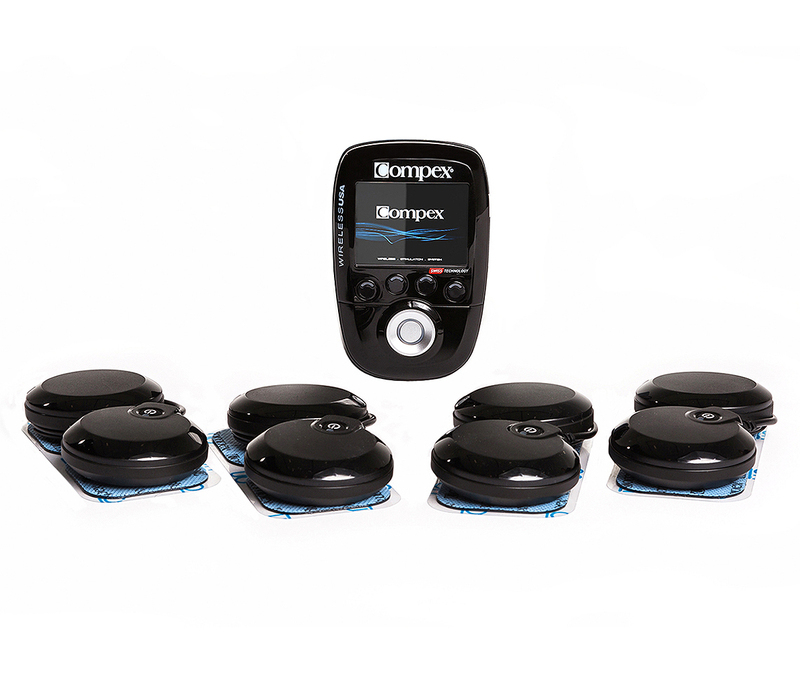 It’s called NMES, neuro-muscular electrical nerve stimulation; more specifically, we’re talking about two NMES stimulators from Compex, a company that’s been in the business of electrotherapy for over 20 years. So why should you want to try it out? For one, NMES can help you heal quicker if you’re coming back from an injury. But, it’s not just for guys who have been sidelined. It can also help you recover faster after a brutal WOD and even boost your performance in workouts by better activating body parts. And it doesn’t hurt—aside from some alien tingling sensation you quickly get used to. I can attest to this; I tested both the Compex Sport Elite Muscle Stimulator Kit and the Compex Wireless USA Muscle Stimulator Kit. Compex is FDA approved for a multitude of goals, like increasing your muscle size, strength, and density, boosting VO2 max, honing greater explosive strength, and faster muscle recovery. And clinical studies prove athletes can increase muscle size, strength, and endurance within a few weeks when combining Compex electric muscle stim in a regimen; it’s also been shown to flush lactic acid out of muscles faster, getting you back on your feet and giving you a greater capacity to perform than using traditional methods or nothing at all. High-profile athletes like Phil Heath use the device to boost strength gains. “If you want to lift more, you need to get the right muscles firing,” Hearn says. 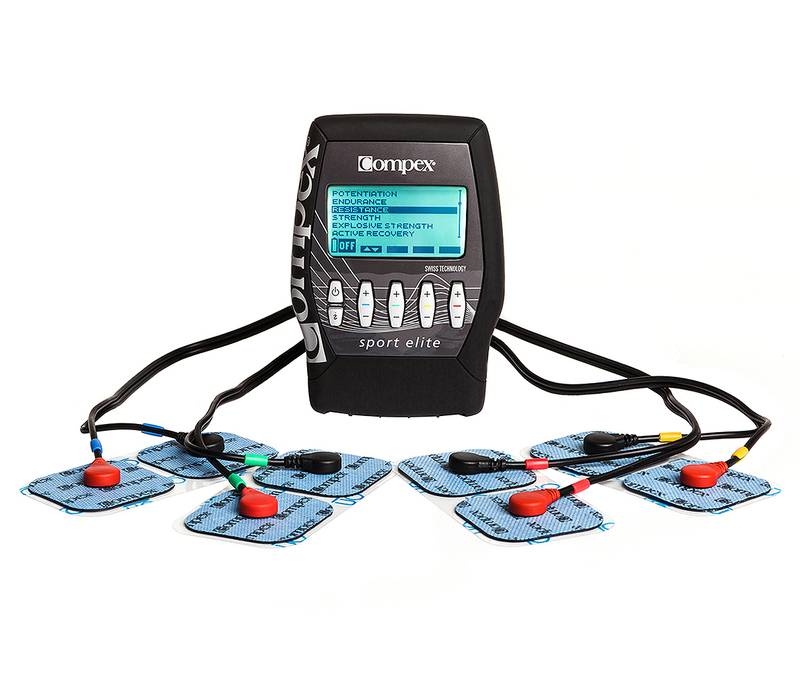 The Compex Sport Elite Muscle Stimulator Kit has 9 pre-set programs (so no guess work! ): Endurance is designed to build your resistance to long-duration aerobic fatigue by promoting the growth of more slow-twitch muscle fibers over a span of 45 minutes. Resistance encompasses endurance and strength, activating the growth of both slow- and fast-twitch fibers for running and lifting in just 12 minutes. Strength boosts pure muscle strength more efficiently than weight lifting alone and reduces your risk of muscle and tendon injuries in 20+ minutes. Explosive Strength can bolster your vertical leap by developing greater short bursts of power without the strain of plyometrics; you’ll work in very brief durations, completing exercises like jumps, sprints, and throws in this program. Potentiation warms up your muscles, getting them up to their max working potential, without the usual fatigue of a warmup. Active Recovery helps diminish soreness and relaxes your muscles post-workout. Recovery Plus flushes lactic acid from your muscles in just 7 minutes, Hearn says; this program doesn’t actually contract your muscles, but increases blood flow, perfect after competitions, races, and vigorous routines. Pre-Warmup doesn’t contract your muscles either; it runs a current at a certain frequency designed to oxygenate muscles before a workout and increase blood flow. Massage improves the movement of blood and oxygen through your blood vessels, too. The Compex Wireless USA has all the same beneficial programs as the Sport Elite Muscle Stimulator. The only difference is it’s portable. By going wire-free, you can attach the pods to the electrode pads, and go through your workout without fear of yanking anything out of place. You don’t have to have a certificate in physical therapy, but you definitely need to read the instructions and electrode placement guide for the best results. The electrode pads are sticky and you don’t want to handle the side you’ll place skin-down too much. Clean your skin with soap and water (sweat, oil, and lotion break down the pads’ stickiness, but they’ll typically last 15-30 uses). Then, follow the placement guide and apply the pads. Now, for the Sport Elite, you’ll snap the electrodes right on the pads, making sure the red cable (positive electrode) is on the pad over the “motor point of the muscle” and the black cable (negative electrode) is placed on the “muscle trajectory.” Don’t worry. This sounds complicated, like you’re jumping a car, but everything is color-coded and spelled out on the online manual. For the Wireless, you connect the pods onto the pads by sliding them onto the metal applicators; they’ll snap right into place. The biggest difference you’ll notice between the two is in the control unit. The Wireless device is superior in its usability. The LED screen lights up when you power on, giving way to the pre-made settings. Choosing which setting you want, the area of your body you’re working, and adjusting the intensity of the resistance is intuitive and seamless. The Sport Elite takes a bit longer to get used to. Sometimes you’ll power the device off when you’re trying to get a program started, so it takes some putzing around to get used to the controls. When you’re done, you just snap or slide the electrodes off, and stick the pads back on their plastic for storage. The Wireless electrodes fit into their own docking unit. When I met with Hearn, I tested the Wireless USA unit. With electrodes in place on our biceps, we went through the Resistance program together. Now, to reach a significant percentage of working fibers, you need to hit a minimum intensity of 30 mAmp (the red zone, about 250 mAmp, will deliver surprising soreness). Sitting in chairs with hands resting on our thighs, palms facing up, Hearn started the workout, using resistance level 3. The current is strong; Hearn describes it as a biting sensation—and that’s no joke. Your arms will probably jerk uncontrollably at first in response to the buzzing energy coursing through your body. (Mine did.) These contractions should be powerful, but you don’t want them to be intolerable or overpowering. From here, the program begins. You only need about 6-10 contraction phases for a solid strength and performance workout, Hearn says. During the stronger “work” contractions, we completed bodyweight arm curls. During the “rest” phases, I relaxed my arms and rested my hands on my thighs; the intensity automatically drops to 50 percent during each rest phase to promote blood flow and improve recovery rate. Once the work phase begins again, Hearn raised the stimulation energy to recruit a higher number of muscle fibers. The idea is to keep raising the intensity after each bout. FYI, the ceiling is 999 mAmp on power. The workout only lasted a few minutes. “In two days, your biceps will be more sore than you’ve ever felt before,” Hearn says. He wasn’t kidding. The next day, a significant amount of soreness was sinking in; by day 2 I had a hard time extending my arms out straight. It’s like the first time you ever did a significant lifting session, or tried a brand new program for the first time. I was equally as impressed during the Massage and Active Recovery programs, too. “Traditionally you’d use a device like this two hours after training—but before bed is ideal,” says Drew Little, C.S.C.S., a performance specialist at Michael Johnson Performance, an elite training facility in McKinney, Texas. That’s because men have a big spike in growth hormone and testosterone at night, which helps burn off fat and build more muscle. “Shower, so your skin is clean for the electrodes, muscles are warm, and your blood vessels are open, as this will lower the resistance to the electric current, make for a cleaner contraction, and provide better recovery and stimulation,” Little explains. Now, if you did a high-intensity sprint or heavy squat, you don’t want to complete a program on a device thats just as intensive. “Post-workout, use programs that have a short duration of work and long periods of rest—like a 1:4 or 1:5 work to rest tatio—compared to ones that are 1:1,” he suggests. The concentric contraction won’t fatigue your muscles, because it pumps blood in, then releases, which is what your heart does. You can also use a device in tandem with resistance training. On leg day, before your workout, set the electrodes on your quads or glutes. Complete 6-8 (max) contraction cycles on a resistance level 3 or 5; squat or lunge for 8 seconds on, 4 second off. Then complete the remainder of your leg workout. After, throw on the Recovery Plus program for about 7 minutes to clear lactic acid. Or, use a device after your workout. Do your typical leg day routine. Next, apply Compex first to your quads, and choose resistance, strength, or explosive strength. Turn the intensity up with each contraction, and then do the same for hamstrings. Want bigger calves? Put a bar on your back and do calf raises with the electrodes in the proper place; that’s more than enough to blast your weaknesses. If you’re a baseball player, playing in a rec league with some buddies or competing competitively, use the Massage or Pre-Warmup programs to keep your muscles ready to go during breaks. If you’re traveling, use the Massage or Pre-Warmup programs to keep oxygen flowing through your legs on a flight. *You don’t want to use a device like Compex on the resistance setting every day. To periodize your training, Little suggests doing 10-15 treatments as a strength stimulus if you lift heavy weight (that’s 3-4 weeks). Then give your body about a month break, only using the device for recovery. This will revert your body back to its natural tendency, so you can progress and further gains the next time you use a resistance program again. If you’re serious about your overall fitness and recovery, this is a sound investment. The Compex Sport Elite Muscle Stimulator Kit is $649.99 and the Compex Wireless USA Muscle Stimulator Kit is $1,149.99. For the ease of use and added mobility, opt for the Wireless.